William Mabie came to the Vineyard to work for Coastwise Packet in 1972. He first worked on the wharf and then spent a full season on the Shenandoah in 1973. After college Mr. Mabie held numerous marine employments including: research, fishing, shipyard, and rigging. Mr. Mabie worked for ExxonMobil for 28 years, the last eight years in the oil field off West Africa, including Cameroon, Angola, and the Congo River. His talk will focus around the importance of the Eldridge Tide and Pilot Book from 1875 through today. 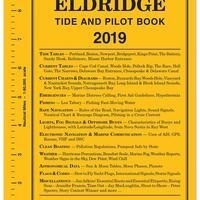 The Eldridge Tide and Pilot Book has impacted navigation, sail, power, small and large vessels and it continues to be of importance for anyone navigating our local waters. Come get a taste of Vineyard storytelling at it’s best.